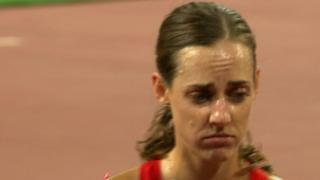 American Molly Huddle is left devastated as she loses 10,000m bronze to compatriot Emily Infeld on the line at the World Athletics Championships in Beijing. As Vivian Cheruiyot of Kenya took gold and Ethiopia's Gelete Burka silver, Huddle was celebrating bronze only for Infeld to come past. Cheruiyot becomes a four-time world champion in a time of 31 minutes 41.31 seconds.